Since you're not bringing SAR, you'll have to assume her duties of looking good with the rest of the wives that come. With that being your duty, the whole team will be accustomed to you not being much help fairly quickly! She bettta recognize!! we need our SAR fix! Sorry for not posting an updated list lately, been a little busy. Please let me know if I missed a post with shirts on it. Well that bodes well for you taking Todd's place! Well crap....you were serious about SAR not coming.. There has not been that much action on this page lately. There has been no changes to the T-Shirt list since 02/15/2018. I know the date to order is approaching. Good to know - any final changes to the design? I don't see what design was settled on? John, please take Kelli and I off the shirt list. We're still coming, just not going to be able to do shirts. Aight folks.....just under three weeks and counting. Time to pump some life into this mix. List is looking good except a few odds and ends. I'm sure Todd and I will be getting together here soon and starting to plan the fill of the trailer! Dilly Dilly! We also need to decide on a T-shirt color and design TODAY per Meghan. Meghan has given us two designs. I'm leaning towards the Masters of the Grill shirt to cover Team Chicken, Team Fajita and even Team Kid Food's grilled cheese LOL.. 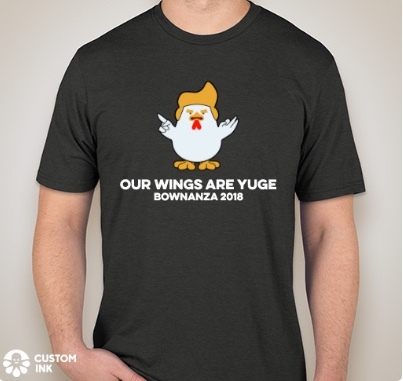 I have asked her to look into referencing Bownanza 2018 on the shirt somewhere as well but the design choice is still up for a vote. Hell I even like the chicken one too but was thinking about what Erin said with two Trumps shirts in a row. As far as colors. We've had everything from Black, lime green/ chartreuse and 3 Heather grays. I'm all for a neutral desert tan, khaki or taupe color that's more in line with a camo color. Maybe even an olive drab or black ...lol The other teams have had them in the tans and I always thought they looked slick. But that's one mans opinion. Last edited by Smart; 02-26-2018 at 08:10 AM. Fine with Masters of the Grill in black or Olive. Masters of the Grill is allsome! Put in the appropriate wordage for bownanza, date, location etc. and we have a winner. I like the olive color as well. I will check on the color options available in the size spectrum we need. Camo isn’t available in all of the sizes (checked earlier). As for t-shirt colors....the one checked (charcoal grayish?) black or green works for me. im all for gray t-shirts -- they are my favorite. So here is Friends of the Grill, which can also be Masters of the Grill. I just need a final design decision, shirt color and a final order count ASAP. The soft shirts run up to 4X, and are $13-$14 each. I want to ensure I give them time to get them printed and shipped for free. Have you seen Jason and Kevin at work on those grills? They are Masters for sure! Btw, thanks for your help on these Meghan! excellent -- i vote "dilly dilly!" I'm down!! Thank you Meghan! Chris sorry just saw this, been busy. I guess this is the final list. Please add Megan and I to the shirt order. Hey John, update the list and post it here please sir! I need to get the shirt order in ASAP. Hit a little snag with our shirt source but we good! Just need to get it in soon to plan B.
OK folks.....unfortunately Dilly Dilly is trademarked and the company Meghan did the design with would not print the shirt. Our mistake for not thinking about that being an issue on an item that will not be resold by us.....but it is what it is..
We found out about this around 2:30 this afternoon after Meghan had fronted the money and sent in our design. 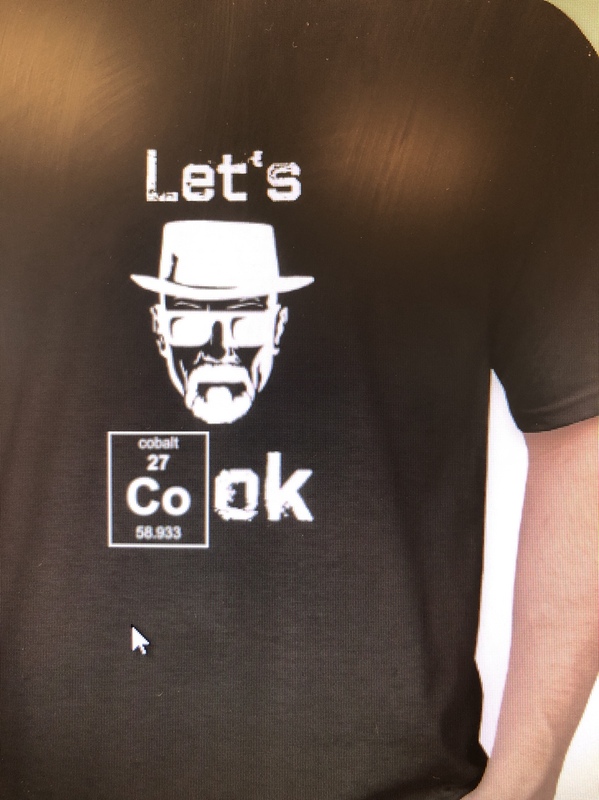 Up against a Friday deadline at 3 pm with no time to rebuild one and Meghan being $850 in for shirts to them already , we had to brainstorm and come up with something that would suffice. We ran it by a couple of team members who have replied back quickly in our building of the original one and every one said yes. Some even said they liked it better so....up against said deadline we went with it with no time to spare. Its a play on the actual phrase but it works for us. Hope y'all like it. Thanks again Meghan for plowing through this and getting it done..
Each shirt is $15.95 including shipping. Thanks folks! Looking forward to it. Last edited by Smart; 03-02-2018 at 07:02 PM. Well played Meghan and Smart. I like the Grilly Grilly!! Last edited by RascalArms; 03-02-2018 at 07:27 PM. Will do tonight when I get home from work or tomorrow! Last edited by Smart; 03-02-2018 at 09:09 PM.